PUCRS’ Sports Park is a modern complex for physical activities, built according to international standards of quality and excellence, using the most advanced construction techniques. Equipped for the practice of numerous sports, it offers excellent facilities in the multi-sport complex and the sports stadium. It serves the university community and the general public, welcoming people of all ages. With a comprehensive infrastructure in terms of space, equipment and support services, the Sports Park hosts many national and international events. The following services are available: Gym, Swimming Pool, the Orlando City Soccer School and several areas for rent for people who wish to lead a healthy life. Multiple structures are available there. An Olympic-size thermal pool and an area reserved for the audience, multi-sports courts, gyms, an artistic gymnastics runway, rhythmic gymnastics and martial arts runway, tennis courts and an auditorium. On the outside, the complex features sand courts and a paddle field, five-a-side, 7-a-side and 11-a-side soccer fields , as well as the University Stadium (for soccer, athletics field, area reserved for the audience with a capacity for up to 2,100 spectators), a walking track and a playground. 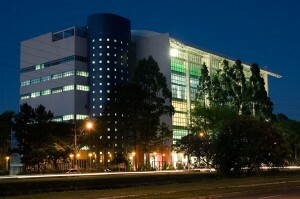 It is located in Building 81 of the Main Campus. Go on a virtual tour of the Sports Park here.